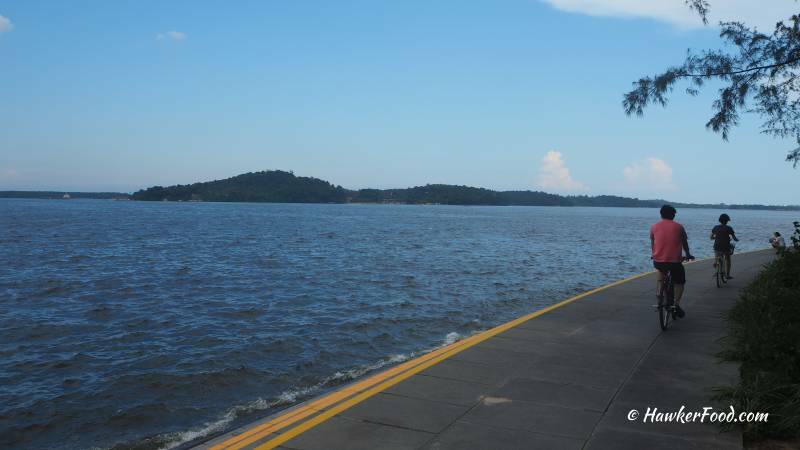 On a sunny day in December (even though the monsoon season is raging), Lao Beng took bus no. 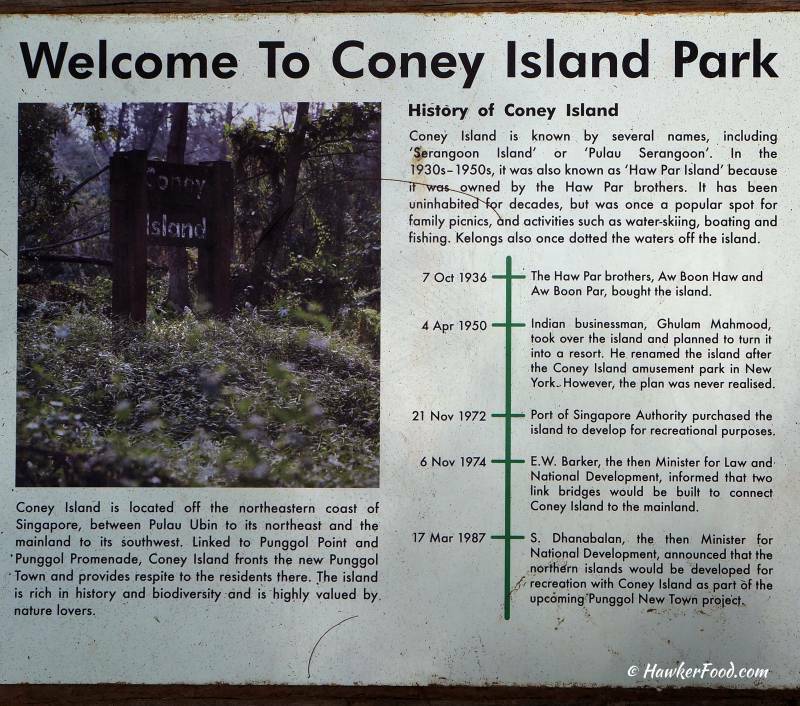 84 from the Punggol Bus Interchange to Punggol End en route to visit the much talked/hyped about Coney Island Park. 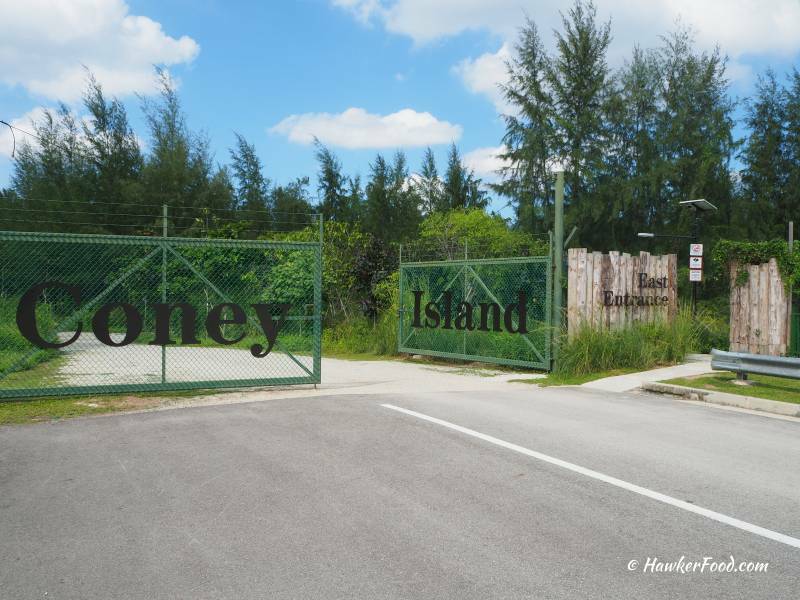 Coney Island Park is also called Pulau Serangoon is a 50 hectare island located north east of Singapore. 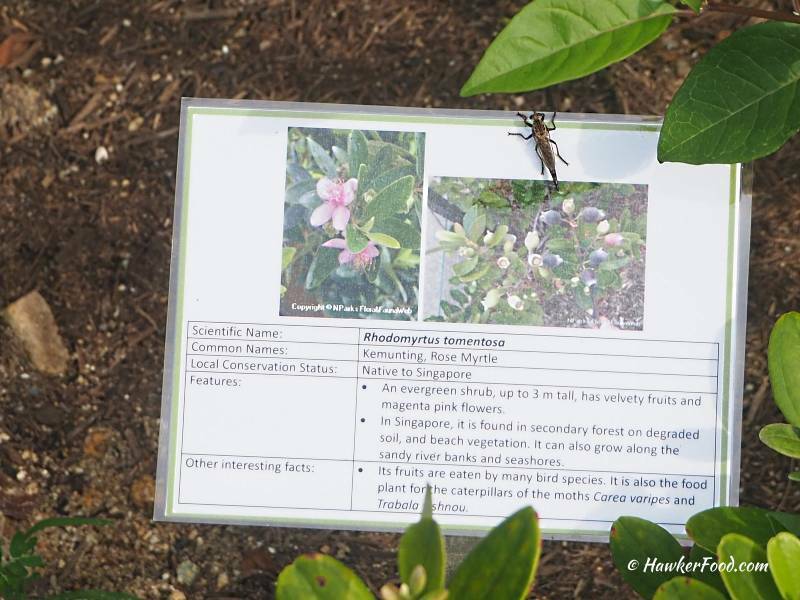 It was opened in October 2015 and has seen many visitors since its inception. This was my second attempt after getting stuck at the bus stop on my first attempt a couple of days ago due to a downpour. 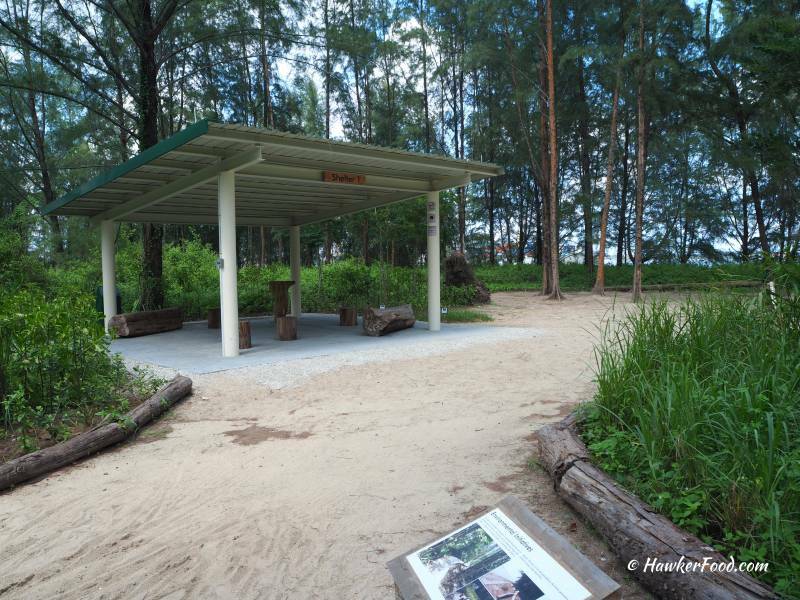 I alighted at the Punggol End bus stop and walked towards the Punggol Promenade taking in the beautiful view created by the sunny weather. Before you embark on your journey, I would recommend that your bladder be emptied first as the toilet in Coney Island Park is some distance away. As this is a public toilet, the cleanliness cannot be compared with shopping centres toilets. You can always patronize one of the restaurants for a meal and use their toilets before you embark. 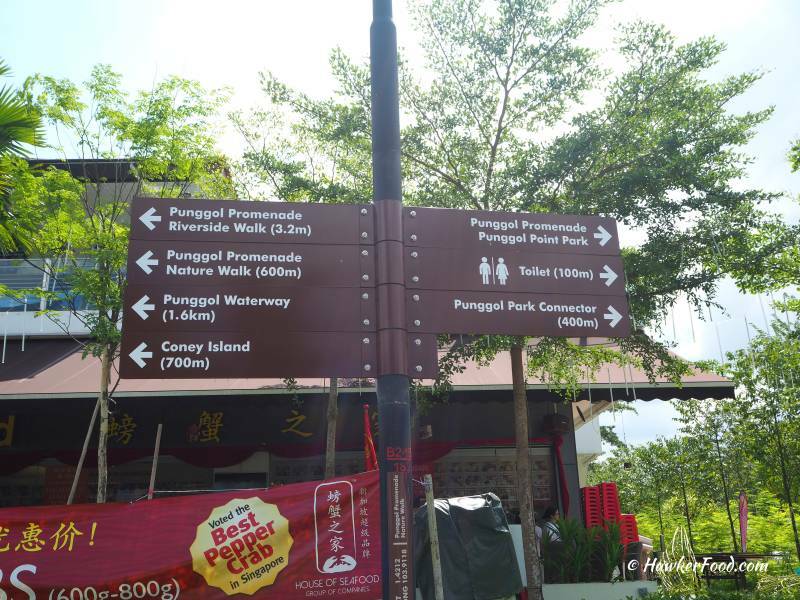 At the Punggol Settlement, you will be able to see signs that direct you to the various destinations accordingly. If you did not bring any water, you can always visit the 7-11 or other convenience stores to get your drinks. Hydration is very important on a hot day. 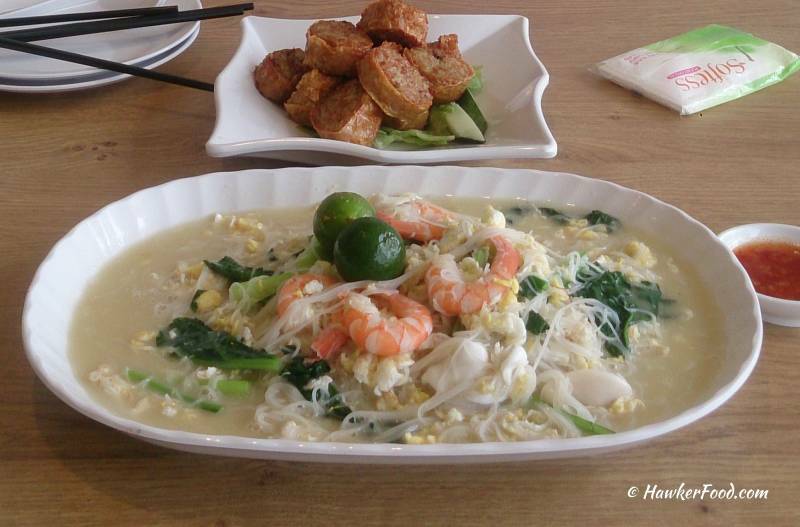 If you are hungry, why not have a plate of Sembawang White Bee Hoon first?? Yummy!! White Restaurant is a good place for its delicious food before or after your visit to Coney Island Park. 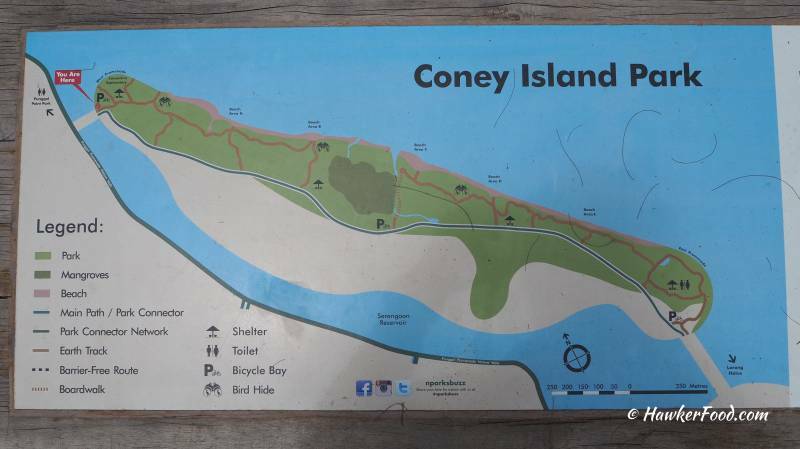 Cycling to and exploring Coney Island Park is the most popular choice. 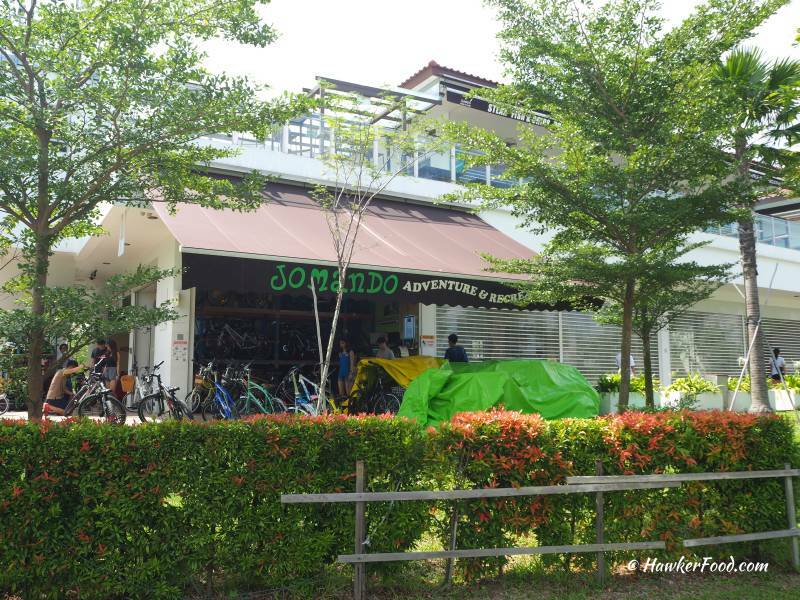 You can rent a bicycle at this shop; for those who wish to explore the island slowly, you can take “Bus 11” and that is practically your pair of legs. 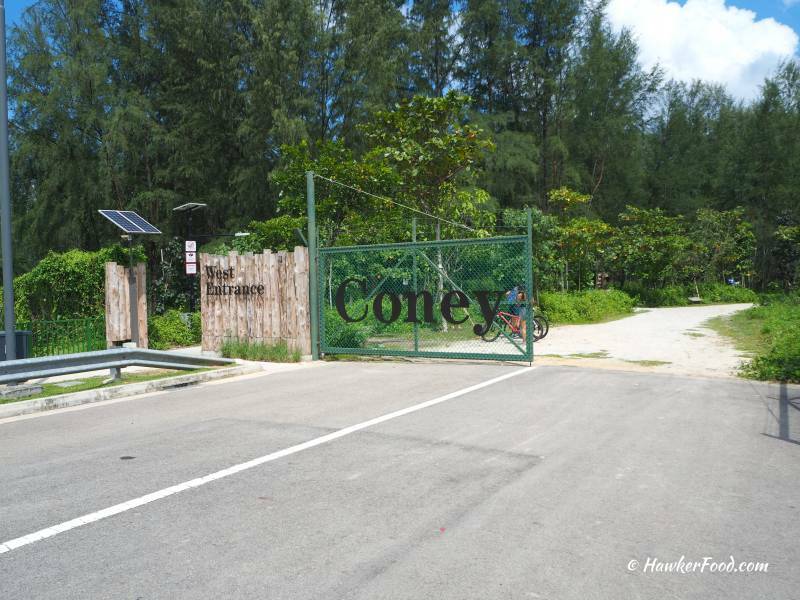 It takes about five minutes of leisure walk to reach the West entrance of Coney Island Park. Almost every darn person who goes through here will take a selfie/wefie to post on social media proclaiming to the whole world: “been there, done that”. Before I enter, I pasted the Watsons mosquito repellent patches on various parts of my clothes. 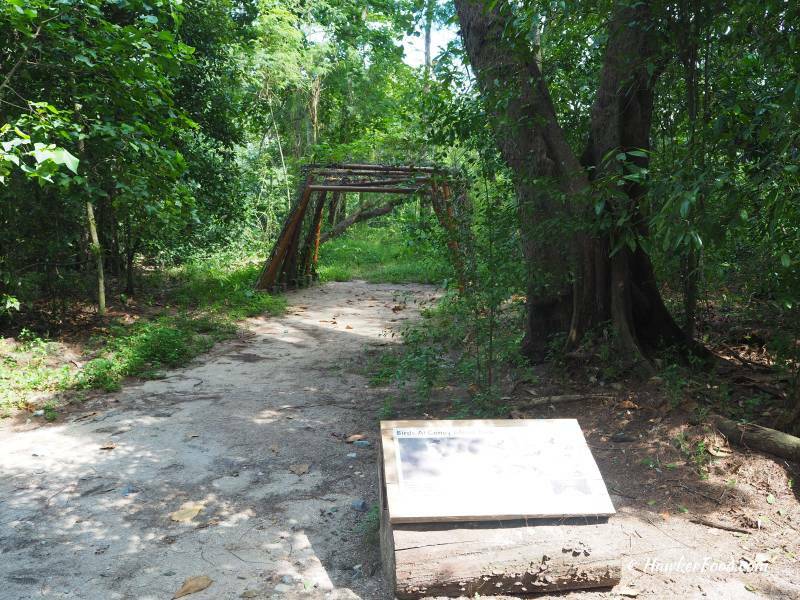 A few steps after the entrance you will be able to see the Welcome signboard and read about the history of this island. 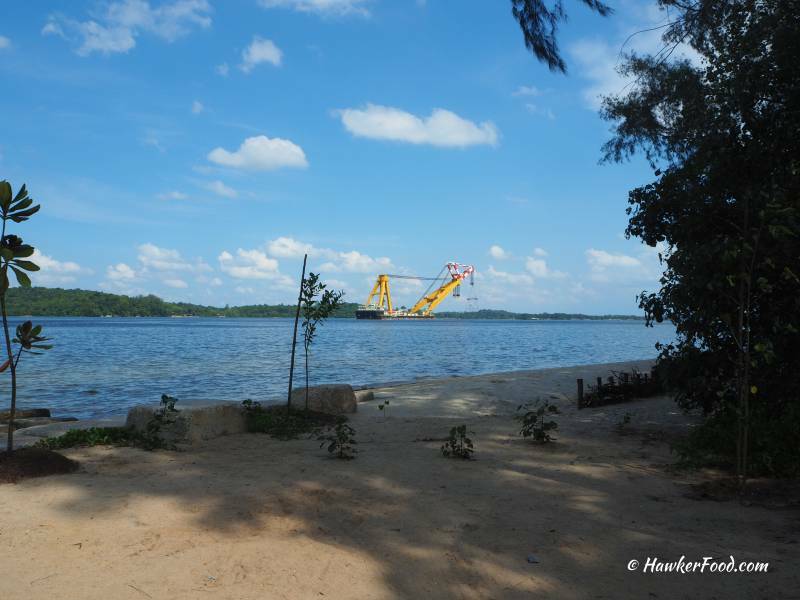 The distance from one end to the other end of the island is 2.4km. 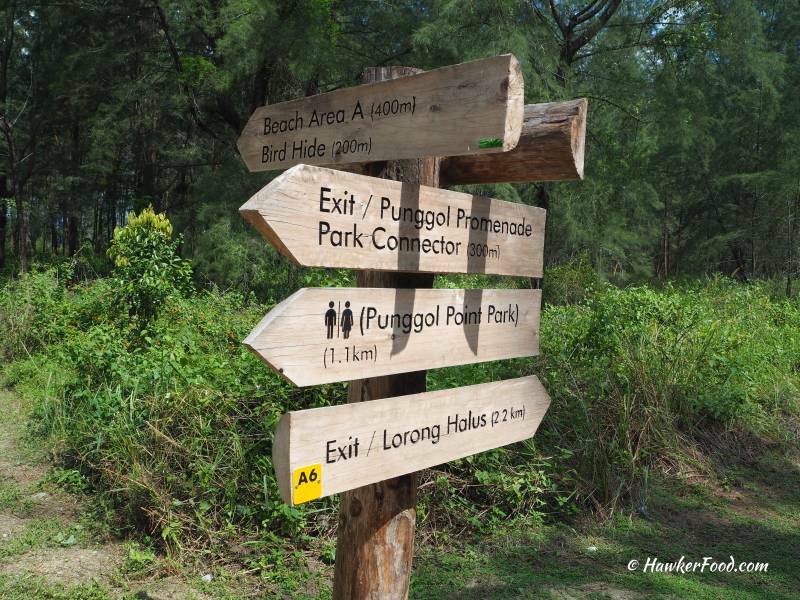 Signs aplenty to guide you along the way. 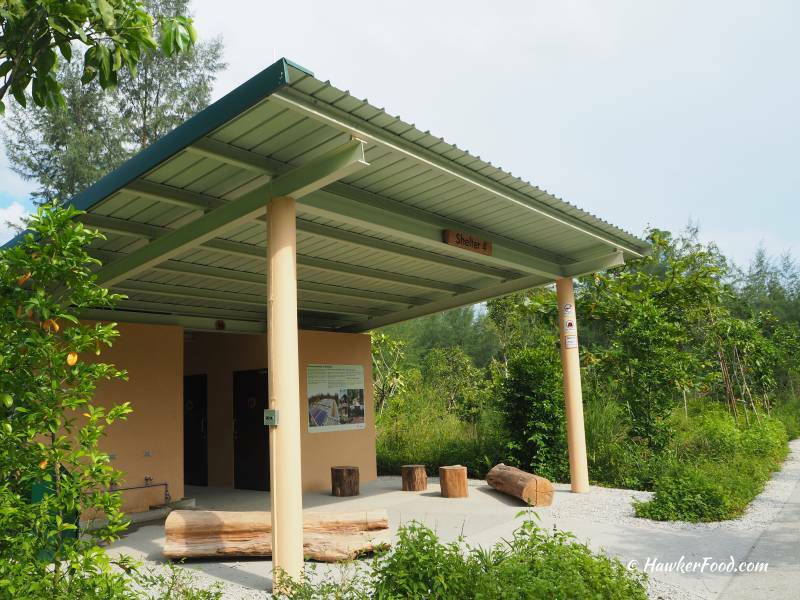 There are various shelters along the island for you to take a rest and to avoid the rain. This is the bird hide where I spent some time acting like a Peeping Tom looking out for the birds but could find none in sight.. I walked further up and reached the beach. It gave me a very rustic feeling and I love the sight of the ships that are so close to the island. *Take note, sand flies had been reported at the beaches thus it is prudent to wear long pants and covered shoes and spray plentiful of insect repellent on your body. 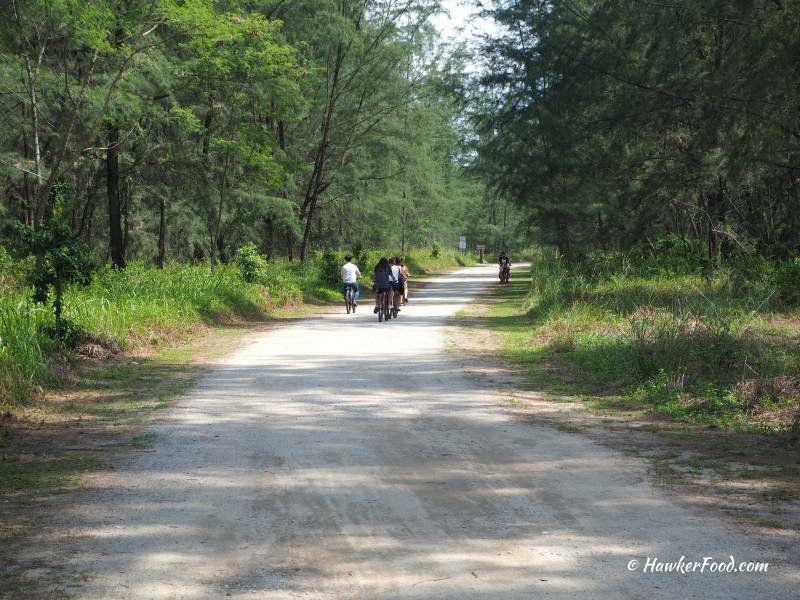 This is a nice island for cycling and there were only a few walkers like me. 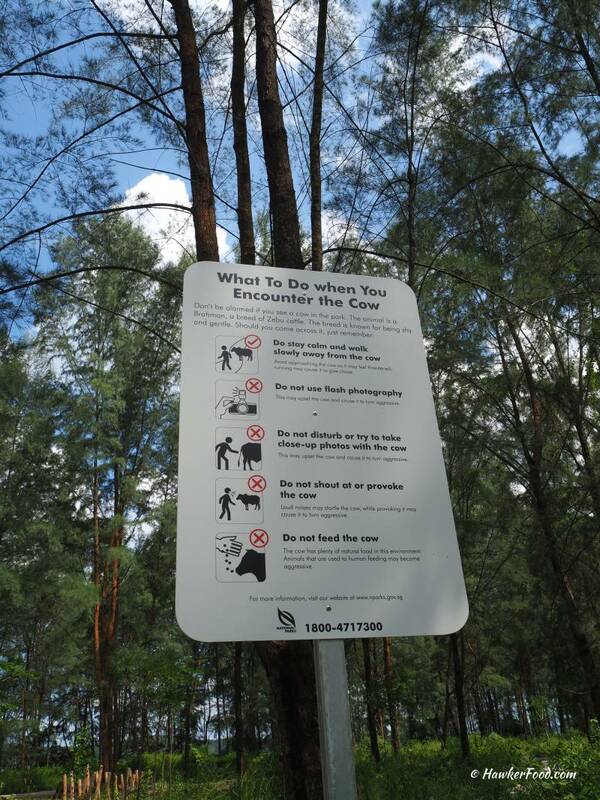 This is the sign describing what to do if you encounter the Brahman Cow. I believe out of hundred who read this probably only ten of them had seen the Brahman Cow. 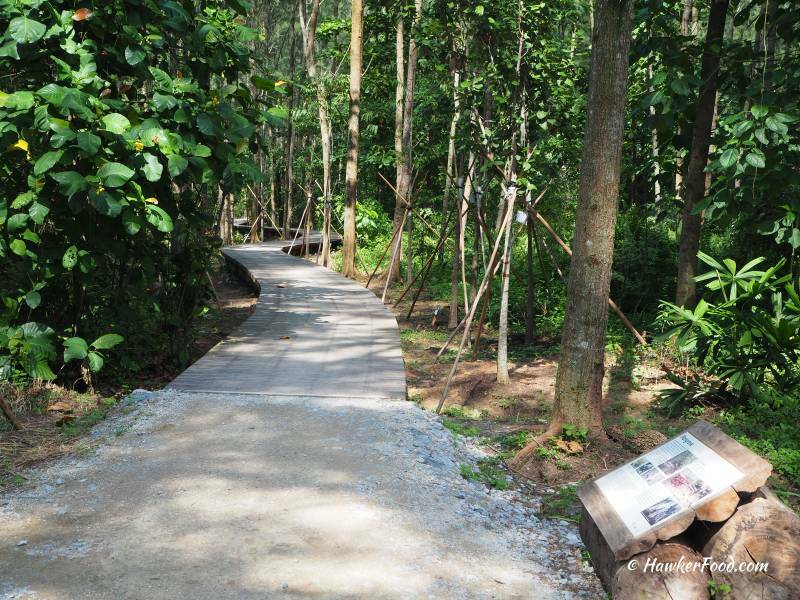 Boardwalk has been created for an easy access to view the mangrove habitats. 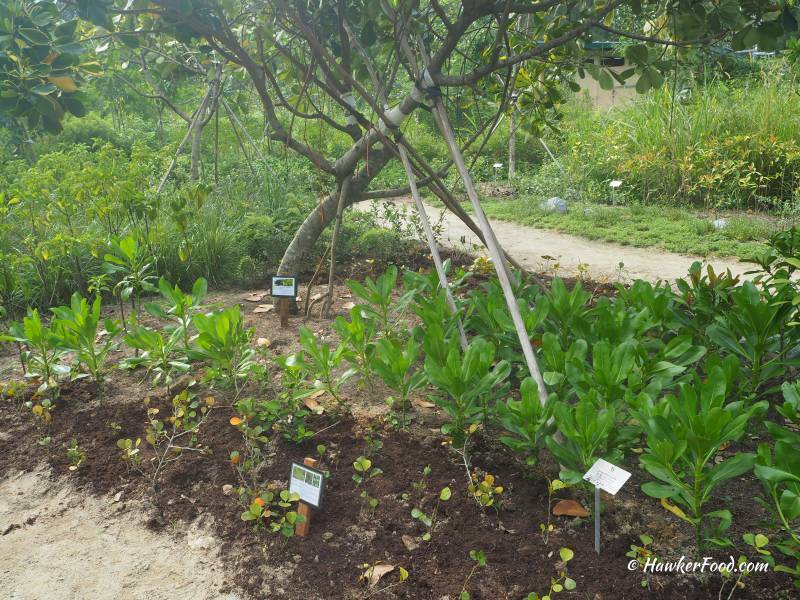 You can see a number of plants that had just been planted. Could not resist taking this picture. 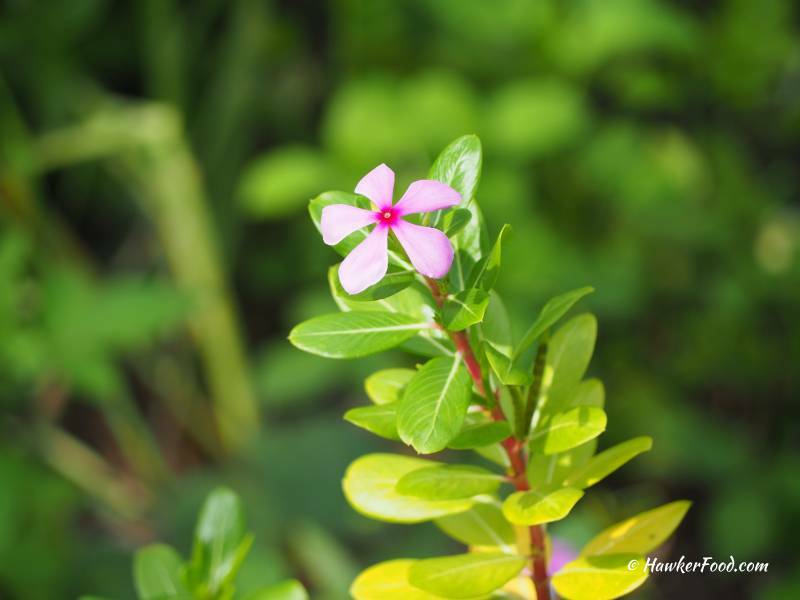 I managed to find some lovely flora and I really hope to see more of them blossoming when I visit the next time round. 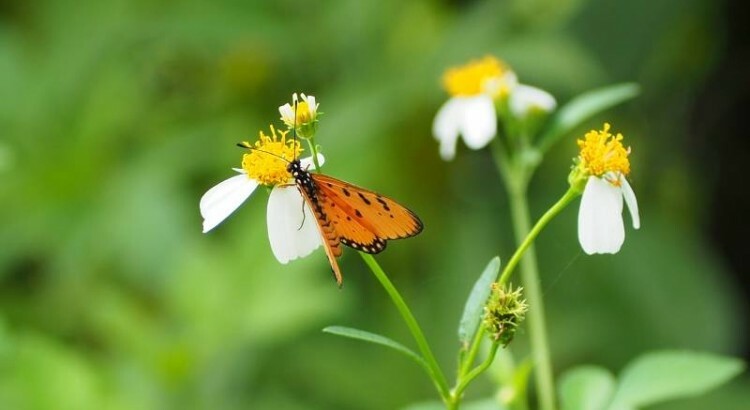 This is what nature is all about, seeing all these insects busy with their own lives brings you out of the hustle and bustle scene of our little country. When you see this building, it means you have reached the other end of the island…. …which means you have reached the East Entrance. 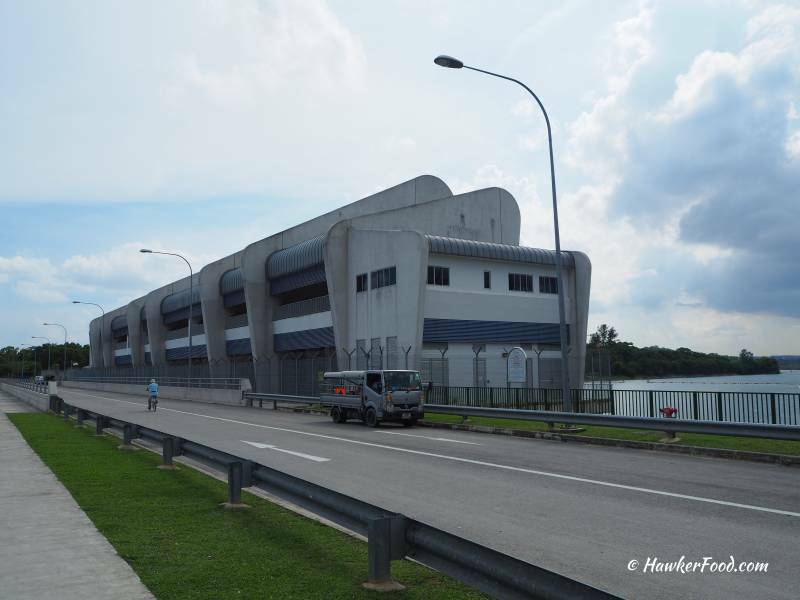 After a long walk, it is time to visit the toilet before I head back to the west entrance/Punggol Settlement area. 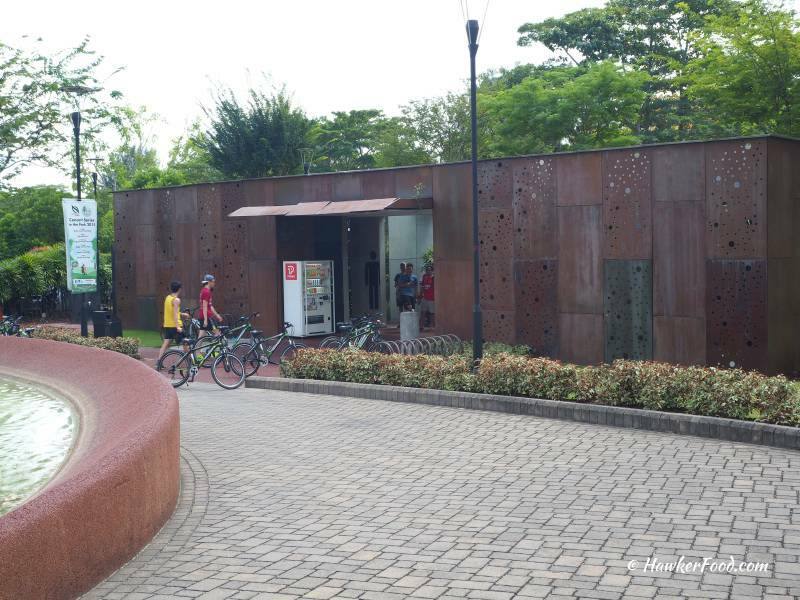 This toilet is located near to the east entrance and east promenade. On my way back, seeing the vegetation brings me back to my army days of bashing through the thick vegetation in Pulau Tekong. Would I do it again? Thanks but no thanks. 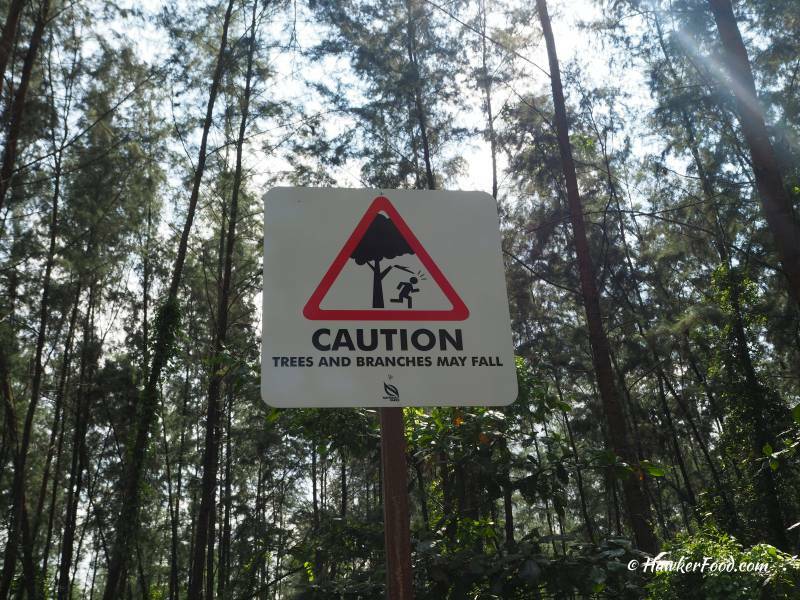 At all times, one must be vigilant as there are chances the trees and branches may fall and this is especially so during heavy rain or thunderstorm. 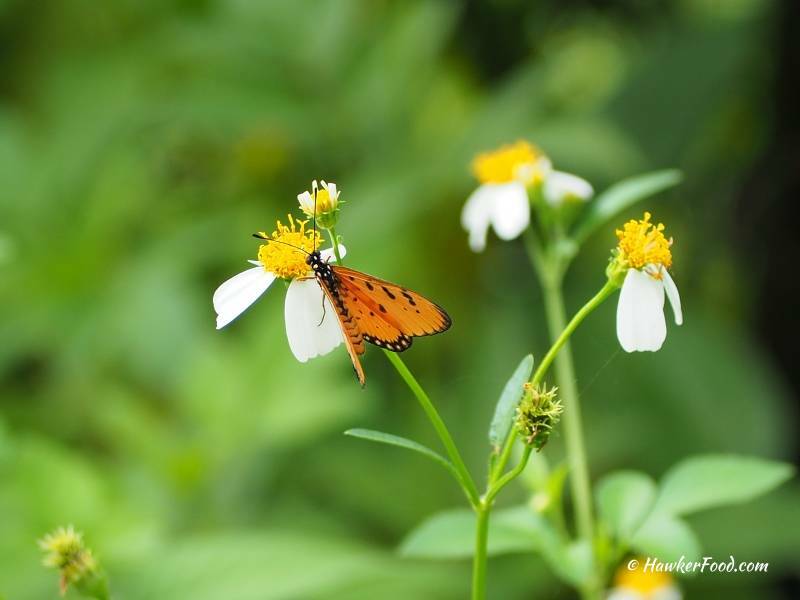 Considering now (December 2015) is the monsoon season in Singapore, please take extra care and only visit the island after checking the weather forecast. 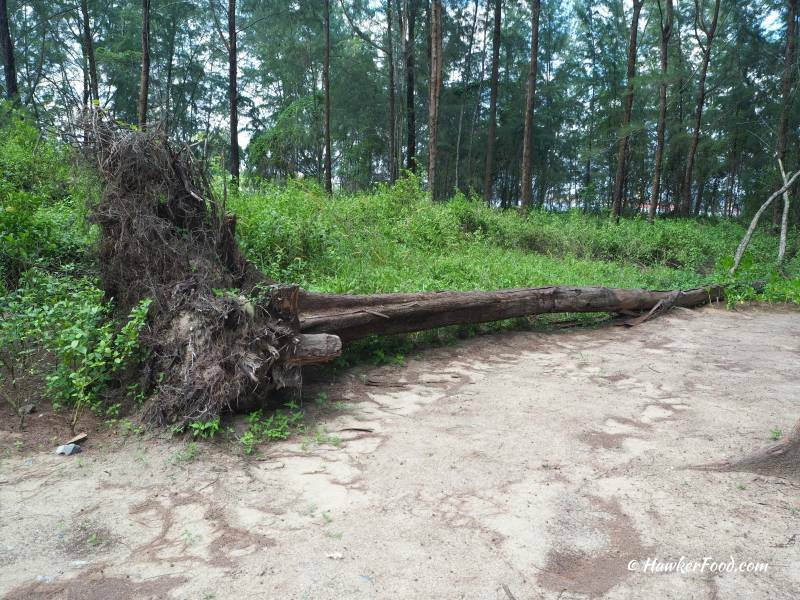 An old fallen tree, I have seen other fallen trees along the way. Thus, exercise caution and look out for one another. 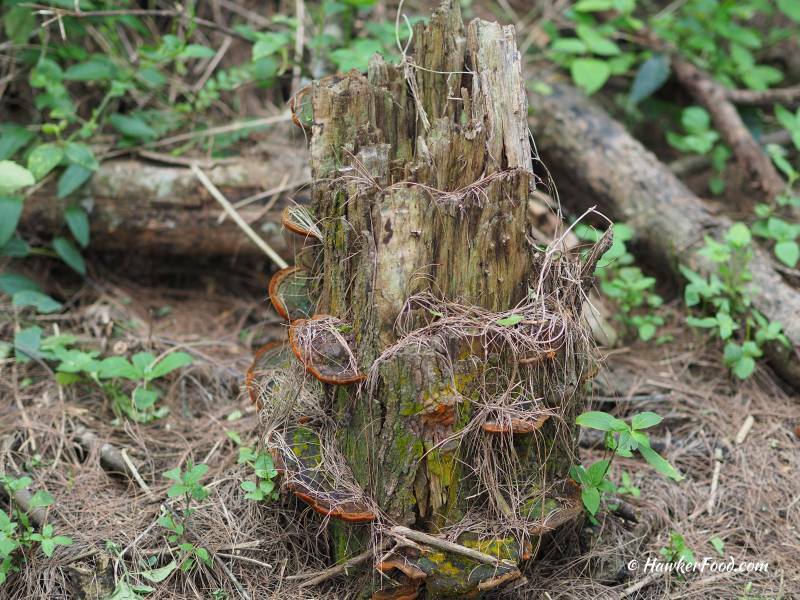 Fungus!!! Stay away!!! Do not let your little ones near them. Finally, I reached the west promenade near evening time. The scene here is nice and the cool breeze was fantastic. 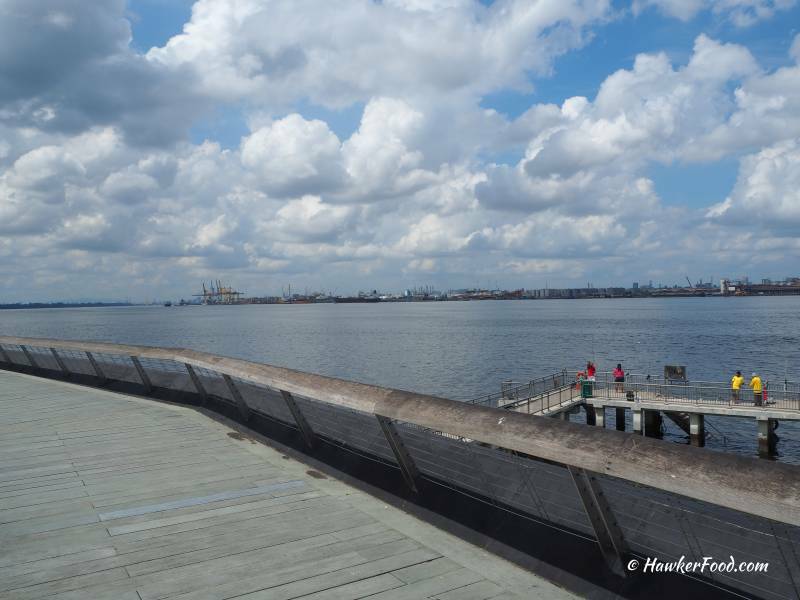 You can sit down at the steps and enjoy the splashing sound of the waves. 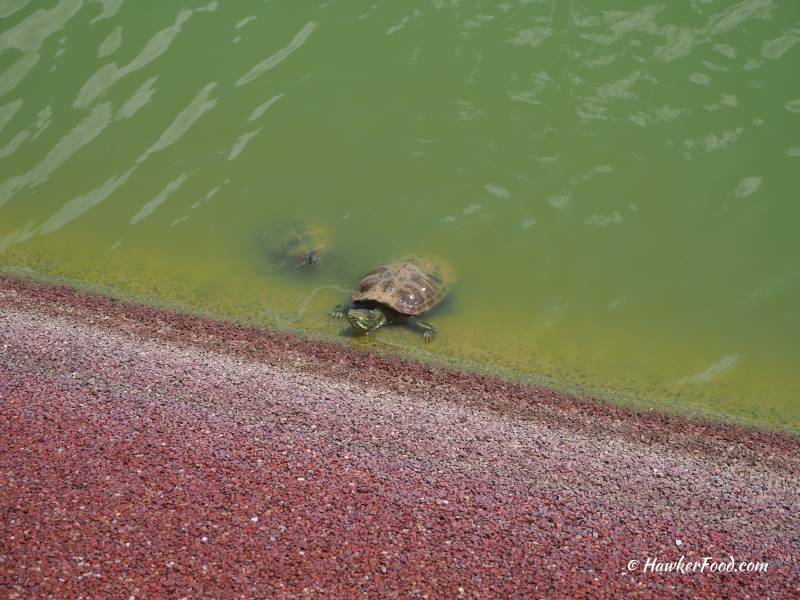 In conclusion, Coney Island Park is a nice place for both the young and old. You can spend quality time with your friends and family over here. 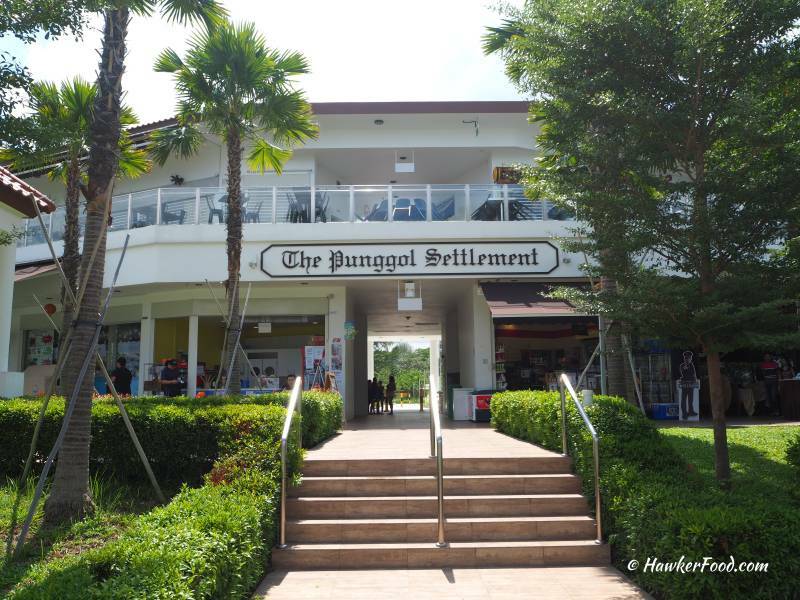 There is also a plethora of restaurants over at Punggol Settlement to whet your appetite. The park is open from 7:00am to 7:00pm and gate will be closed outside opening hours. Please check the weather forecast before you travel to the park. 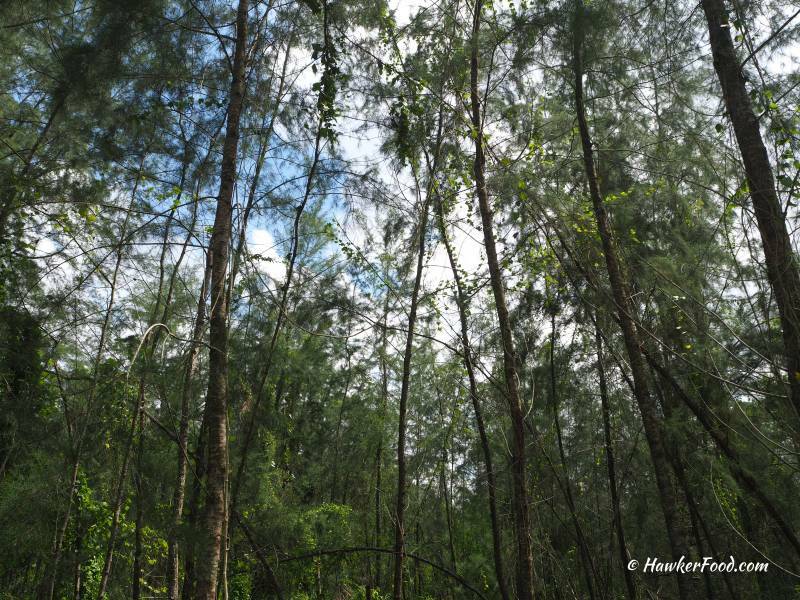 Be careful and take extra caution especially during adverse weather conditions as the tree or branches may fall.